ASHTABULA - Patrolman Larry Ellison had a sinking feeling Thursday morning as he approached the East 21st Street exit of Route 11. "There was a car in the pond," he said. "I knew it wasn't good." His hunch was right. 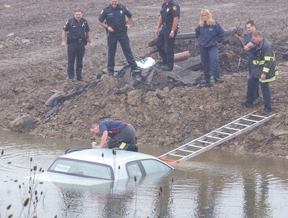 About 9:30 a.m., Ashtabula police received a call of a car submerged in a pond off the northbound East 21st Street exit ramp. Police quickly arrived on the scene - only to discover no one in or around the vehicle. A towtruck was called to pull the abandoned 1993 Mercury Cougar out of the water. Police said the car was traced to Mark Bokan, 46, of Niles. When he was contacted, Bokan told police he loaned his car to a 16-year-old Ashtabula resident, who did not have a driver's license, Ellison said. "The 16-year-old was traveling at a high rate of speed when he exited (Route 11) at the 21st Street exit," Ellison said. "He lost control of the vehicle and it struck a stop sign, crossed over East 21st Street and, at that point, he jumped out of the vehicle." The car continued on its course into the water. "We're still searching for the young man," Ellison said Thursday afternoon. "We don't expect him to show up for a while." Police charged Bokan with allowing a non-licensed driver to operate his vehicle. Ellison said several charges would be filed against the teen, once they find him.